In a scene from Nila Madhab Panda’s Kadvi Hawa, a village teacher is giving the kids a lesson on the seasons. According to the books, there are four, but a kid answers that there are two, summer and winter. “What about the monsoon?” the teacher snaps. The boy says, "It does rain two or three days a year, sometimes in winter, sometimes in summer." Panda’s film is supposed to be about the devastation of climate change, but he approaches the subject in a roundabout way. Most of story is about farmers committing suicide because they are unable to repay bank loans. The audience has to make the connection that the land is arid because of a lack of rain caused by climate change. Kadvi Hawa focuses on one family—a blind old man Hedu (Sanjay Mishra), his son Mukund (Bhupesh Singh), daughter-in-law Parvati (Tillotama Shome) and two granddaughters. When the film opens, Hedu makes a trip to the bank in town to inquire about his son’s debt and is rudely driven away because he does not have money to pay. Back in the village, a farmer has hanged himself, and then news comes that a strict recovery agent, Gunu (Ranvir Shorey) has arrived; wherever he goes he causes a couple of suicides, earning him the nickname of Yamdoot. Gunu is from Orissa, where floods have destroyed him home and killed his father. He takes an assignment in this hot and dry area because he gets double the commission for recovery. The film is more tell than show, a card at the end gives statistics of how many people died in “super cyclones,” and how many suicides have been caused by climate change and how many more people will be pushed into poverty by 2030, but the film itself leaves a lot unsaid. It’s not as if the viewer is looking for suffering and tragedy, but Hedu’s family seems well fed. They live in a decent house and are not dressed in rags. The granddaughter goes to school, and the family has a cow. There is dialogue about Mukund having to go to the city to work at a construction site, presumably because there is not enough water for farming, but there is no indication of famine or a devastating water crisis. 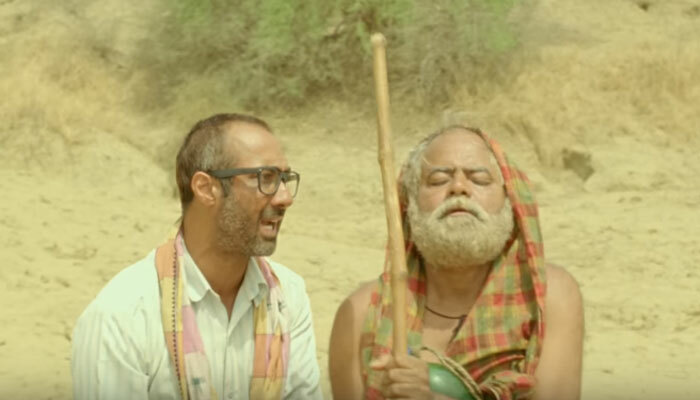 Kadvi Hawa may have its heart in the right place, but think of films like Dharti Ke Lal, Do Bigha Zameen, Godaan, Do Boond Paani about the tragedies of rural India, and one can see how the new film—made for a festival audience—falls short, despite excellent performances by Mishra and Shorey. Gulzar’s poem, Mausam beghar hone lage hain, recited by him, at the end of the film, is a lot more impactful and thought-provoking. Films about social issues must be made, and urban audiences must know how the other half lives, but if they do not reach an audience or appeal to them, the effort is wasted.